God’s Consuming Spiritual Fire Power is again demonstrated in preserved prayer room saved intact despite devastating fire that destroyed the Bethel Community Church. A miracle happened at the heart of the church when God’s Supernatural Fire POWER saved HIS WORDS recorded in sermons. The Bible says God puts HIS WORDS ABOVE HIMSELF so human fire did not destroy God’s preserved words on tape. Even in the midst of adversity, tragedy or spiritual attacks God always comes through with a testimony of His Word. In this case literally preserving precious priceless sermons that GLORIFIED HIS Holy Name. The father of current pastor passed into heaven 18 months ago and heaven and the angels ensured God’s words did not perish. The prayers of the righteous avails much as proved by the Holy Presence of God in the church. The Bethel Community Church prayer room survived unscathed in the devastating fire which tore through the church. The pastor of the fire-ravaged church said it is “quite incredible” that a prayer room survived relatively unscathed. Worshippers speculated a “spiritual fire” protected the room, Pastor Andrew Cleverly said. Mr Cleverly is hoping to retrieve tapes of his late father’s sermons which are stored in the room. About 95 firefighters and police officers responded on 15 June but it took until the following evening to put out the blaze. A 43-year-old man and a woman, aged 36, were arrested on suspicion of arson released pending further inquiries. 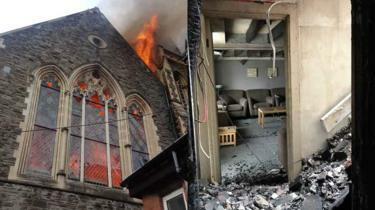 An image released from inside the church shows a room and furniture within it apparently untouched by the fire. “Pastor Andrew Cleverly called for the community to “stand up and be strong” after the fire. Mr Cleverly said some of the community had “found comfort” in the belief that its use as a prayer room had shielded it from the fire. It is quite incredible really,” said Mr Cleverly, who got image from engineer. “Said it was left untouched. And there was no fire door, I think it was just a wooden door. “People are taking comfort in the belief that the reason the room was still intact was because of Spiritual Fire which the ordinary fire could not penetrate.Bethel Community Church dates back to the 1880s. Mr Cleverly’s father was the former church pastor who passed away 18 months ago said the room was used to store audio tape recording of father’s sermons. “When it is safe to do so, will to try and retrieve them,” he said. 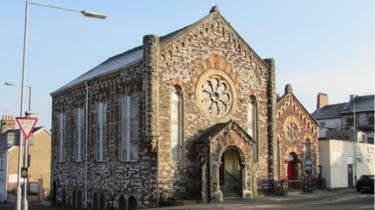 And a special service will take place nearby at Havelock Street Presbyterian Church from 15:00 BST on Sunday. “It will be a special time of reflection and a time to come together,” added Mr Cleverly. “I would like to thank the Havelock Street Presbyterian church which has very, very generously offered us a space for worship.” The Pastor has thanked Havelock Street Presbyterian Church for offering his congregation a place to worship. He also thanked the community and the local businesses for supporting the church. 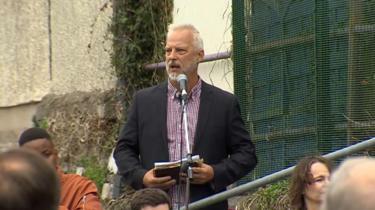 “Sometimes it takes something like this that shows how a community comes together,” he added. 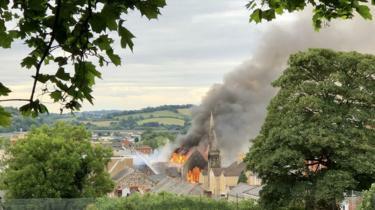 The 130-year Grade-II listed Bethel Community Church on Stow Hill in Newport was destroyed after a fire spread from an old nightclub next door. The significance of this true story is at times tragedy destroys physical structures and the material possessions but God helps to strengthen faith and the Spirit of God in believers encourages us to continue by faith because it is well with our soul in Christ Jesus Name. Material things and structures can be replaced but the Spirit of God in mankind is irreplaceable for eternal salvation. Spend time with those you love is a rich man’s lasting advise to people to enjoy life better! “I reached the pinnacle of success in the business world. In other’s eyes my life is epitome of good success. However, aside from work, I have little joy. In the end, wealth is only a fact of life that I am accustomed to. At this moment, lying on the sick bed and recalling my whole life, I realize all the recognition and wealth I took so much pride in have all paled in comparison because now life became meaningless in the face of impending death. You can employ someone to drive the car for you, make money for you but you cannot have someone to bear the sickness for you. The material things lost can be found. But there is one thing never found when lost is “Life.” And the person fulfilling precious family times goes to places to created fond memories in appreciation of priceless valued lives. If not otherwise years later in operating room realizes that there is one book has yet to finish reading called, “The Book of Healthy Life.” Whichever stage of life in right now, with time, do not wait until it is too late to faced the day when the life curtain comes down. Treasure Love for your family, love for your spouse, love for your friends and Treat yourself well. Cherish others. Growing older, became wiser and slowly realize that wearing a $300 or $30 watch both tell the same time in that specified location. Whether carrying $3000 or $3 wallet or handbag the amount of money inside is the same. Whether driving a $150,000 car or $300 car the road and distance is the same so both get to the same destination. And whether one drinks a bottle of $300 or $10 wine the hangover is the same. And whether the house lived in is 3000 sq ft or 300 sq ft, loneliness is the same. You will realize, your true inner happiness does not come from the material things of this world. Jesus said that a man’s life does not consist of material possessions. Whether you fly first or economy class, in the plane you both arrive at the same time. You realize, when you have mates, buddies, friends, brothers, sisters, and family you chat with, laugh or talk with, sing songs and dance with or help each whether living north-south-east-west or in heaven or here on earth, That is true happiness!!! 1. Don’t educate your children only to be rich to buy and sell. Educate them to be Happy. So when they grow up they will know the priceless value of life too not just the price of material things. 3. Those who love you never leave you because despite 100 reasons to give up on you they find one reason to hold on. 5. You are loved when born. You will be loved when you die. In between, learn to love God, others and yourself! NOTE: If you want to Walk Fast, Walk Alone! But if you want to Go Far in life you join others go Walk Together! Great life lessons learnt help us through mace of living in this imperfect world. When younger we make various choices without the future in mind. Sometimes those choices bite in our mid-life. These are some of the things one might regret. When you’re young, check your motives for wanting to marry. Do not marry to copy your peers, for social standing, out of pressure. Ensure you marry for love and companionship, marry the right person, marry your best friend. For if you marry the wrong person or for the wrong reasons, you will have to put up with person the rest of your life. Things might get worse between you two; then depression, physical abuse, affairs, pain, shame, court cases, bitterness defines mid-life years all because you chose the wrong one. Things will get worse when children are involved. Make the right choice of a spouse when you are young. The younger care little for relationships, what most think about is getting money and moving up ladder of success at all cost. Many use and trample on people to progress, take relationships for granted, messing bonds, sleeping with people for personal gain. These bad actions does catch up with ahead. And realizes how empty life is without love or friends. If you have success but has no one around you or trusts you it’s a lonely life. A young lady if pregnant or scared may take termination option rather quickly thinking in the moment. But when you are much older, you will look back and wish you kept that baby. When you are rich and successful you may wish that child you gave up would be around to enjoy fruits of your hard work. Being a single mother doesn’t mean you can’t make it in life or can’t marry in future. Young man, you impregnated a woman, she told you she’s pregnant with your child. You rejected her and baby and ran. Years later you’re 50 something, you will wish you were responsible, you will wish you manned up and became a father to that child. You will see child excel and become an adult but will have no claim to the grown up child rejected from the beginning. You regret being a Dead Beat Dad by choice. So you get married to your good fiance; the first months in marriage were good but shortly after, with your money and charm, you started having affairs. You became unfaithful. Spouse begged you to stop, your children started hurting, your marriage was collapsing. One day when you are older, it will hit you how foolish you were to destroy the good marriage you had began to build for temporary thrills in affairs that did you no good. You will realize the damage you caused to your children and spouse. 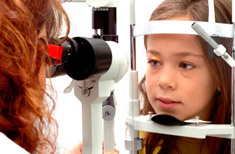 Are you talented when young; are there things you love to do and you are good at them? Nurture those talents, exploit them, don’t give up if you encounter set backs, don’t give up on your dreams. If you give up, when you’re older you will look at peers who do what they love and made it and think to self, “That could be me.” Pursue a career, study course you love. Don’t waste years of your life in a field that doesn’t fulfill you. When older, a legacy is very important, the value of a name is crucial. You will ask yourself what reputation are you leaving behind? Your legacy is a sum total of your actions since youthful days. The written biography of how we live life everyday counts. When you look back your path and see the mud threw at the name, the shame you attracted and the little value you have added to the world; you will regret. God’s Still Small Voice heard by Elijah in troubled times helped him to make the necessary decision to bring changes to the whole nation of Israel and himself. Rumbling earthquake noises preceded the fires announcing God’s Presence. To hear God’s voice requires listening to a still small voice. Almighty God is often perceived as talking in an exaggerated hyped high pitched thunderous voice of magnitude proportionate to His Size. It is surprising God chose to speak in that still small voice. This means we are to hear God during the quiet and the still moments of life too. God said, “Go out and stand on mount before the LORD.” Behold, the LORD passed by, and a great and strong wind tore the mountains and broke in pieces the rocks before the LORD but the LORD was not in the wind. After the wind an earthquake but the LORD was not in the earthquake. After earthquake a fire, but the LORD was not in the fire. After fire, came God’s still voice whisper sound. Holy Land region. Earthquakes caused the year-long, global flood in the days of Noah. God used Earthquakes, Tsunamis, Volcanoes. Physical cause of earthquake was shifting of adjacent tectonic plates in Noah’s Flood to warn of God’s anger. And at that hour there was a great earthquake, and a tenth of the city fell. Seven thousand people were killed in the earthquake, and rest were terrified and gave glory to the God of heaven. For in my jealousy and in my blazing wrath I declare, On that day there shall be a great earthquake in land of Israel. Finally, then, brothers, we ask and urge you in the Lord Jesus, that as you received from us how you ought to walk and to please God, just as you are doing, that you do so more and more. For you know what instructions we gave you through the Lord Jesus. For this is the will of God, your sanctification: that you abstain from sexual immorality; that each one of you know how to control his own body in holiness and honor, not in the passion of lust like the Gentiles who do not know God; . You will be visited by the Lord of hosts with thunder and with earthquake and great noise with whirlwind and tempest and the flame of a devouring fire. Jesus left the temple and was going away, when his disciples came to point out to him the buildings of the temple. But he answered them, “You see all these, do you not? Truly, I say to you, there will not be left here one stone upon another that will not be thrown down.” As he sat on the Mount of Olives, the disciples came to him privately, saying, “Tell us, when will these things be, and what will be the sign of your coming and of the close of the age?” And Jesus answered them, “See that no one leads you astray. For many will come in my name, saying, ‘I am the Christ,’ and they will lead many astray. Then the earth reeled and rocked; the foundations of the mountains trembled and quaked, because he was angry. On that day his feet shall stand on the Mount of Olives that lies before Jerusalem on the east, and the Mount of Olives shall be split in two from east to west by a very wide valley, so that one half the Mount shall move northward, and the other half southward. According to the covenant that I made with you when you came out of Egypt. My Spirit remains in your midst. Fear not. For thus says the Lord of hosts: Yet once more, in a little while, I will shake the heavens and the earth and the sea and the dry land. And I will shake all nations, so the treasures of all nations shall come in, and I will fill this house with glory, says the Lord of hosts. The silver is mine, and the gold is mine, declares the Lord of hosts. For then there will be great tribulation, as has not been from the beginning of the world until now, no, and never will be. And if those days had not been cut short, no human being would be saved. But for the sake of the elect those days will be cut short. For in my jealousy and in my blazing wrath I declare, On that day there shall be a great earthquake in the land of Israel. The fish of the sea and the birds of the heavens and the beasts of the field and all creeping things that creep on the ground, and all the people who are on the face of the earth, shall quake at my presence. And the mountains shall be thrown down, and the cliffs shall fall, and every wall shall tumble to the ground. For thus says the Lord of hosts: Yet once more, in a little while, I will shake the heavens and the earth and the sea and the dry land. And I will shake all nations, so that the treasures of all nations shall come in, and I will fill this house with glory, says the Lord of hosts. When he opened the sixth seal, I looked, and behold there was great earthquake, and the sun became black as sackcloth, the full moon became like blood, and the stars of the sky fell to the earth as the fig tree sheds its winter fruit when shaken by a gale. The sky vanished like a scroll that is being rolled up, every mountain and island was removed from its place. Then the kings of the earth and the great ones and the generals and the rich and powerful, and everyone, slave and free, hid themselves in the caves and among rocks of mountains, calling to the mountains and rocks, “Fall on us and hide us from the face of him who is seated on the throne, and from the wrath of the Lamb. Behold, the day of the Lord comes, cruel, with wrath and fierce anger, to make the land a desolation and to destroy its sinners from it. For the stars of the heavens and their constellations will not give their light; the sun will be dark at its rising, and the moon will not shed its light. I will punish the world for its evil, the wicked for their iniquity; I will put an end to pomp of the arrogant, and lay low the pompous pride of the ruthless. I will make people more rare than fine gold, and mankind than gold of Ophir. I will make the heavens to tremble, and the earth will be shaken out of its place, at the wrath of the Lord of hosts in the day of fierce anger. The anger of the LORD God was kindled against HIS people HE stretched out HIS Hand against them and struck them, so mountains quaked; and corpses were as refuse in the midst of the streets. For all this HIS anger has not turned away, and HIS Hand is stretched out still. Then I heard a loud voice from the temple telling the seven angels, “Go and pour out on the earth the seven bowls of the wrath of God.” So the first angel went and poured out his bowl on the earth, and harmful and painful sores came upon the people who bore the mark of the beast and worshiped its image. The second angel poured out his bowl into the sea, and it became like the blood of a corpse, and every living thing died that was in the sea. The third angel poured out his bowl into the rivers and the springs of water, and they became blood. And I heard the angel in charge of the waters say, “Just are you, O Holy One, who is and who was, for you brought these judgments. On that day his feet shall stand on the Mount of Olives that lies before Jerusalem on the east, and the Mount of Olives shall be split in two from east to west by a very wide valley, so that one half of the Mount shall move northward, and the other half southward. And you shall flee to the valley of my mountains, for the valley of the mountains shall reach to Azal. And you shall flee as you fled from the earthquake in the days of Uzziah king of Judah. Then the Lord my God will come, and all the holy ones with him. Credit: Open Bible Gospel Good News: Contact: openbibleinfo@ gmail.com. 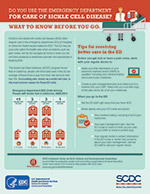 Cite this page: Editor: Stephen Smith. Date: June 5, 2018. Institute for Creation Research. icr.org. The greatest-earthquakes in the Bible. Great earthquakes predicted by Jesus as endtime sign of His Coming in Rapture and later on earth to rule. These great earthquakes happen as the world sees simultaneous volcanoes globally. The rapid rate of occurence is alarming and thousands of people lose lives through volcanoes and earthquakes. Scientists baffled by external pressures causing volcanoes’ major eruptions and these great earthquakes. Debates continue of causes of the volcanoes and these great earthquakes. So Cosmic-solar radiation causing earthquakes, volcanic eruptions and tremors are researched. According to the theory of plate tectonics, Earth is an active planet with surface composed of many individual plates that move and interact, constantly changing and reshaping Earth’s outer layer. Volcanoes and earthquakes both result from the movement of tectonic plates. Interactive activity produces images from NASA, on relationship between earthquakes and volcanoes, boundaries of tectonic plates. Decades of research papers appear in the scientific press clearly showing the correlation between cosmic-solar radiations and destructive geological events like earthquakes & volcanic eruptions. These research papers are supported by statistical evidence that go back hundreds of years. Some research papers have outstanding observed data self-explanatory equipped with correct physics. Researchers could not provide correct interpretation of these data. The reason is the fundamental defects in the basic laws of physics. Since 1967 a study published with the Earth and Planetary Science Letters found that solar activity plays a significant role in the triggering of earthquakes. In 1998 a scientist from the Beijing Astronomical Observatory, Chinese Academy of Science, found a correlation between low solar activity and earthquakes. Another research, carried by Space and Science Research Center in Florida, US, showed strong correlation between solar activity and the largest earthquakes and volcanic eruptions within the continental united states and regions around world. The study looked at data of volcanic activity between (1650 – 2009) and seismic (earthquakes) activity between (1700 – 2009) the recorded data compared with sunspots record (solar activity). The results of study shows very strong correlation between solar activity and the largest seismic and volcanic events, within the continental US and globally. The correlation for volcanic activity was bigger than (> 80%) and for the largest earthquakes was (100% of the top 7 most powerful) versus solar activity lows. The research concluded existence of a strong correlation between global volcanic activity among the largest of classes of eruptions and solar activity lows. With the 80.6% occurrence of large scale global volcanic eruptions taking place (> VEI 5) during solar activity lows and with 87.5% occurring for the very largest (> VEI 6) eruptions during major solar minimums. The last paper read on topic is titled: Explosive Volcanic Eruptions Triggered by Cosmic Ray: Volcano as a Bubble Chamber. The research was conducted by Japanese scientists led by Toshikazu Ebisuzaki. They studied the relationship between solar magnetic activity and 11 explosive eruptions from silicate-rich volcanoes in Japan over the past 306 years. They found that 9 of the eruptions occurred during solar minimum (inactive phase of solar activity). The researchers quite accurate with assumption eruption of volcanoes triggered by cosmic radiation eruption taking place. The mechanism of eruption called bubble nucleation induced by cosmicmuons may not be correct. The process triggers eruption if located deep within magma chamber, several kilometers below surface not 10 m within surface of the volcano. To give credibility to model researchers chose mountain volcanoes. They considered eruptions occurred high above the sea level. Though paper provided clear data shows most destructive earthquakes in 3 centuries in Japan took place during solar minimum. No physical mechanism proposed to explain correlation of deep earthquakes or solar magnetic activity. NASA researchers in 2008 announced a link between electrical disturbances on the edge of our atmosphere impending quakes on ground below was found. So this finding is in agreement with similar studies carried out by space research institutes. Satellites picked disturbances 100 – 600 km above areas later hit by earthquakes. Fluctuation in density of electrons, electrically-charged particles in ionosphere observed, and huge signal detected in time before large magnitude earthquakes strike. Jann-Yeng Liu, from the center for space and remote sensing research in Chung-Li, Taiwan support a link between earthquakes, disturbances in the ionosphere. He examined over 100 earthquakes with magnitude 5.0 and larger in and around Taiwan over several decades. Based on data analysis almost all earthquakes down to a depth of 35 Km preceded by distinct electrical disturbances in ionosphere. Minoru Freund from NASA Ames Research Center, developed a theory based on the above observations. “It boils down to idea when rocks compress tectonic plates shift and they act like batteries, producing electric currents’ in following paper, Air ionization at rock surfaces and pre-earthquake signals. NASA researchers assume compressed rocks release electrical charges which travel upwards into the ionosphere. In reality, however, the opposite is true- the reverse is happening. Fluctuations of cosmic-solar radiations are charging ionosphere. That results in anomalies of geomagnetic field causes the generation of eddy current. The eddy current heats the rocks in the faults and consequently the sheer resistant intensity and static friction limit of rocks decreases. This is the main process trigger earthquakes and volcanic eruption. During solar minimum high energy cosmic radiation penetrates to very deep distance below the Earth’s surface, in some cases a few hundred kilometers. This is reason why most if not all earthquakes during solar minimum are deep earthquakes. The stress on the Magnetosphere during solar minimum is higher because the Heliosphere is weaker and more high energy charged particles can penetrate the solar system. On the average, the flux of cosmic rays is 20% higher during solar minimum. But, if the Sun, is in its highest position in the galaxy-which is the time when the Earth is in its final phase of magnetic field reversal-then the impact of cosmic radiation on both the Heliosphere and Magnetosphere is higher even during solar maximum. At that position Heliosphere is in weakest state due to very intense bombardment from high energy radiations. Relationship between the lowest-highest solar cycles and earthquake-volcanic eruption is supported by overwhelming evidence. Statistical data shows strong correlation between major volcanic activity (based on cubic kilometers of ejected matter), major earthquakes of 8.0 magnitude or more (on Richter scale) and strong solar minimum (grand minimums). In the last two and half centuries major volcanic eruptions occurred during strong solar minimum (Grand minimums): Grimvotn (Iceland) 1783/84 (14 km3), Tambora (Indonesia) 1810 (150 km3), Krakatoa island volcano on Indonesian arc, by Sumatra & Java 1883 (5.0 km3), Santa Maria (Guatemala) 1902 (4.8 km3), Novarupta (Alaska) 1912 (3.4 km3). The only major eruption to occur during a solar maximum was Pinatabo (Philippines) 1991 (between 6 and 16 km3). Similar correlation found in earthquakes. All major earthquakes occurred during strong solar minimums or grand minimums. After solar activity decline significantly between 2004-2010 11 major earthquakes of 8.0 magnitude. in Solomon Islands -8.1(April 2004), Sumatra-Andaman&Indian Ocean tsunami- 9.2 (December 2004), Nias (Indonesia) -8.6 (March 2005), Tonga- 8.0 (May 2006), Kiril Islands (Russia) twice- 8.1 (November 2006 &January 2007), Peru-8.0 (August 2007), Sumatra-8.5 (September 2007), Samoa-8.1 (September 2009), Maule (Chile)-8.8 (February 2010). Scientists are puzzled and cannot give rational explanation why destructive earthquakes took place on grand minimums. Wrong explanation has been given by some Russian scientists. They believe that reduced magnetic pressure on Earth during solar minimum enables tectonic plates to move a little more freely and that would make the release of built up frictional forces between them much easier. But, the magnetic pressure during solar minimum is increasing not decreasing. The stronger is the solar minimum the higher is magnetic pressure. This fact has already been observed. Sensors on board the US Air Force C∕NOFS satellites recorded collapse of ionosphere caused by extreme solar minimum. The bottom line is that all earthquakes and volcanic eruptions-big or small- are triggered by an external pressure induced on Earth’s magnetic field. The Strong Coronal Mass Ejection Flare directed at Earth exerts pressure, that deforms and shrinks the Magnetosphere by as much as 4 Earth Radius (4Re). The pressure affects and impacts the layers of Earth below its surface in different ways. It depends on tectonic of each region. In some regions the tension causes energy to be released in a form of earthquake, while in others it is in the form of volcanic eruption. Very intense magnetic radiation from ultra-dense tiny Stars Magnetars close to the galactic core of our galaxy similar triggered December 26, 2004 Indonesian earthquake. Induce substantial damage to Magnetosphere so intense radiation easily penetrate Magnetosphere, during extreme solar minimum. This energetic increases flux of high energy particles in the ionosphere to several orders of magnitude. The December 26, 2004 Indonesian earthquake was ten times stronger than other earthquakes during the previous 25 years, and was followed 44.6 hours later on December 27th by the detection of a very intense gamma ray burst. It was 100 fold brighter than others in previous 25 year history of gamma ray observation. This gamma ray burst was released from a tiny star located about 10 degrees northeast of the galactic center. Its size is only 20 km in diameter, but it has a mass around 150 solar masses and a luminosity 40 million times than Sun. It releases more energy in a tenth of a second than what the Sun emits in 100,000 years. These kinds of stars can only be formed in the dense regions of the Universe where the intensity of magnetic fields, enormous. Current physics says Neutron stars like Black Holes. Does Neutron Stars exist. Magnetic waves phenomena associated with large magnitude earthquakes is an intense volcanic eruption. A distinctive feature shows lack of understanding of real cause of earthquakes and volcanic eruptions. It is called earthquake light. Observed since ancient times, unusual luminous aerial phenomenon appears in sky at or near areas of tectonic stress, seismic activity or volcanic eruptions. In the last few years seismologists started taking earthquake light seriously and consider it worth scientific research. 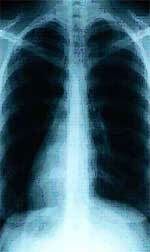 Some theories proposed, do not provide an explanation of the real cause of this phenomenon. Observed phenomenon of evidence shows earthquakes, volcanic eruption happen as a result of the stress induced on Earth’s magnetic field which begins at the ionosphere. Development of a detecting system to observe these electromagnetic disturbances, can be established by satellite network system. Early warning integrated system at the ionosphere is extremely crucial urgent requirement to predict earthquakes and volcanic eruptions. It is high time to understand our planet is permanently linked to the cosmos. All interactions and energetic events on cosmological scales affect or impact our planet in one way or another. Energetic events taking place in our galaxy influences the solar system in very short period of time. The physics of isolationism, self sufficient, partially of the misunderstanding of the force of gravity, and discrete notion of probability theory quantum mechanics, theories of relativity (special & general) are serious obstacles that do not allow us to understand our unified Universe. The Universe exists as a coherent entity. It is absolutely unified by the magnetic force, permanently present in building blocks of matter. For this reason, we are not isolated from events that take place on any scale. The impact of energetic events are determined by distance and intensity of those events. Strong blast of supernova or Gamma Ray Burst from the dense regions of our galaxy shakes entire solar system. Impact of energetic explosions are felt instantly as magnetic fields are continuous. Notion of limited speed of propagation of energetic event, dictated by speed of light continues to have a devastating consequences on the development of physics. The last few decades observed so many cosmological phenomena flaw in theoretical concept. In spite of observations increasing new generations of space telescopes, other detecting observing instruments, on land and in space physicists refuse to question notion of limited speed of light. These observations are enforced in the theoretical concept, by inventing new theoretical assumptions, invention of an imaginary particle, new exotic matter or mystery substance that cannot be detected or observed. Without revising the force of gravity and accepting it as an attractive weak magnetic force that operates between adjacent magnetic fields when the difference in strengths is big (or not zero) without discarding metaphysics or pseudo physics theories of 20th century, progress is impossible. Distortions of the physical reality of the Universe, the theoretical physics of the 20th century affect practical benefits to mankind. Some say GPS works on the principle of special relativity transistor result of Quantum Mechanics (QM), and quantum computer (QC) to be built. But claims scientifically groundless. Go back to the drawing board to revise force of gravity and discard myths of the 20th century physics, to produce most ideal energy source. Modern manufactured technologies used explore Universe in ways beyond imagination of science fiction writers. The Solar Neutrino Problem Not Solved. Are you actually saying in this article black holes is myth? Did I read it right?? Other studies show that solar max has tendency to induce magma or red eruptions…. the theory is swiftly shifting to atmospheric pressures, and bow shocks causing earthquakes, which then support increased volcanism. Lastly, what everyone is missing in this theory is the fact that the low sunspots and higher volcanism may be symptoms of the same cause. In that case sun doesn’t cause quakes, something else would. While I am open to a correlation between solar cycles and seismic activity, I am skeptical about this resulting from variation in solar pressure. Has it occurred to others that quite possibly the two are caused by a thing called gravity? In other words, gravitational pull from Jovian planets, which are lined up and exerting even more pull. There is a host of evidence showing that solar activity may well be related to the position of the Jovian planets. Perhaps the same thing is being done with our planet. Just because two things are occurring does not mean one causes other. The manifestations are the same but different things. Some food for thought…, Auroras are plasma discharges, and visible evidence of pole to pole electric currents. Much like cooking a hot dog by sticking a fork in each end and plugging it into the wall…this energy generates heat in the earth. The energy input gets dissipated by the drag of earth’s turning magnetic field on solar plasma field streaming by earth. Earth’s magnetic field weakens so weakening now, during a magnetic pole reversal, amount of energy dissipated is reduced, heat accumulates in the earth’s mantle where temperatures increase slightly, the heat bring some expansion of the crust, opening channels to far below, and so we have more volcanic eruptions, as we seem to be having. 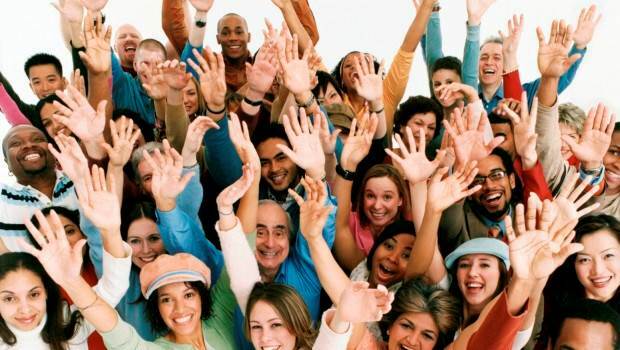 Do you like to advertise on our website? It’s free so can unsubscribe at any time! Issue of music provision in schools is a ‘woeful, inadequate subject,’ says Kadie. 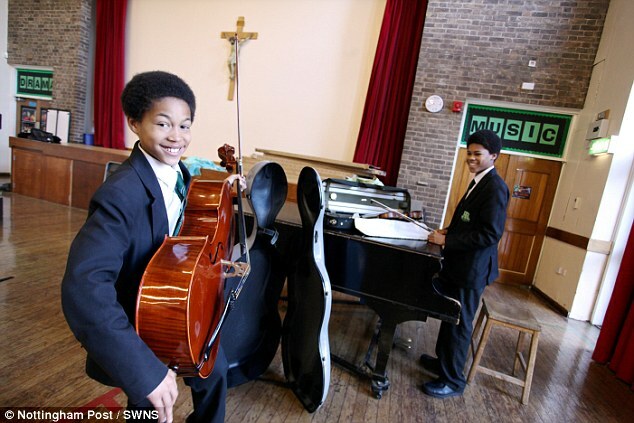 ‘I got free one-to-one lessons at school, I didn’t have a fraction of talent of my children yet not entitled to one-to-one lessons.’ Save for a few small council grants, Kanneh-Masons had no state help but support of schools particularly the comprehensive Trinity Catholic School in Nottingham is vital. ‘It’s a very unusual school, big on orchestras and “normalising” classical music,’ says Stuart. 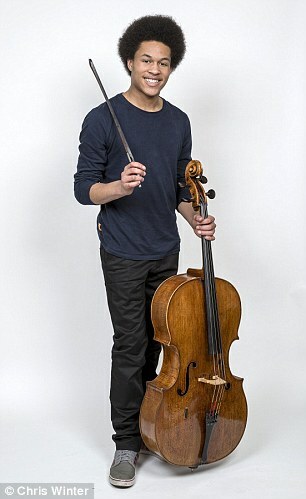 ‘A lot of teenage boys, feel it isn’t “cool” to play an instrument. 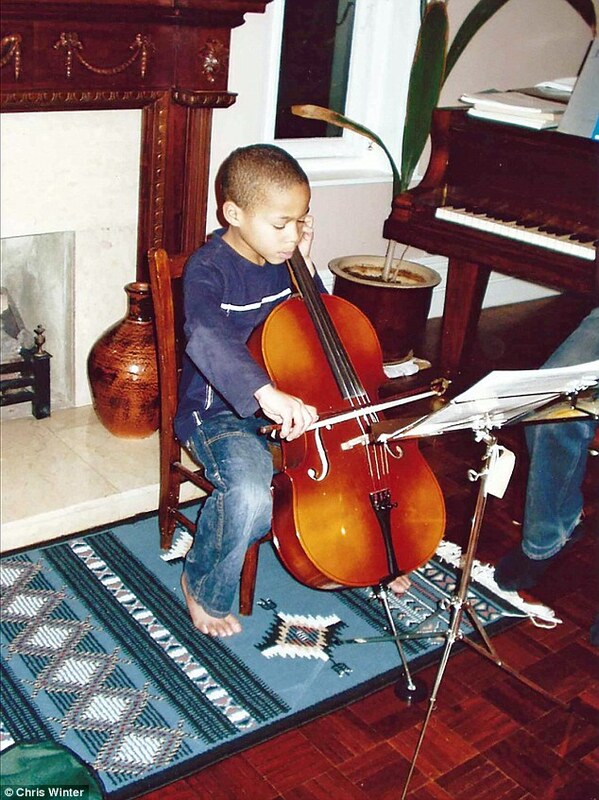 Mercifully, ours never felt that.’ Meanwhile, race was not an issue for the Kanneh-Mason family until recently. Kadie’s family are from Sierra Leone, West Africa; Stuart’s from Antigua, in Caribbean. At school the children were always part of a mix of cultures. In the classical music world, increasingly aware they were rarities. There are few more of us now but at the start in Academy, the only black faces were ours,’ says Isata. 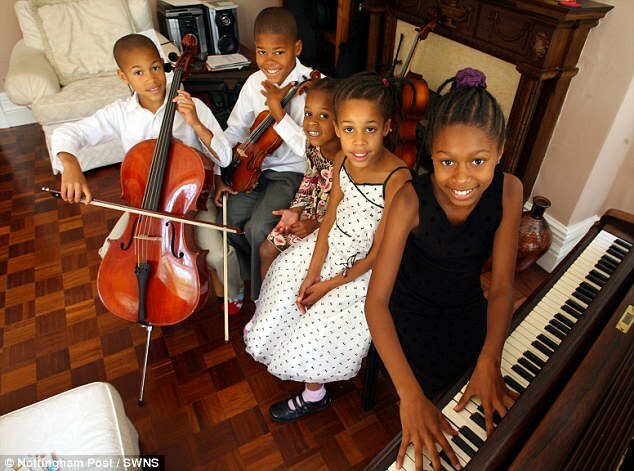 In the past few years the older Kanneh-Masons have all started to play in Chineke! 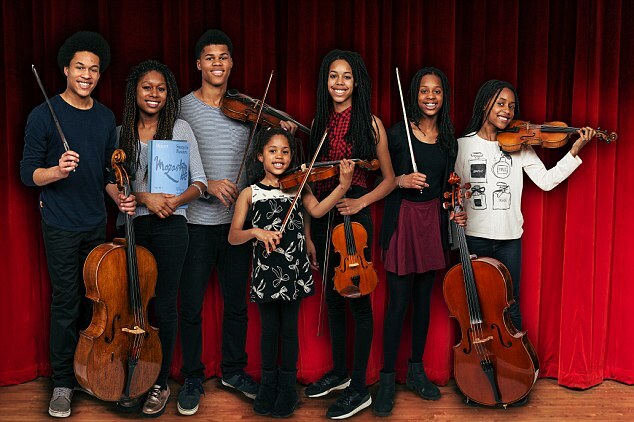 Orchestra, Europe’s first professional orchestra solely of black ethnic minority players. Stuart believe change is coming, though, and that his family are at the heart of it. ‘I remember it being a huge thing when the first black footballers played in old First Division. Now look at how many black players there are at highest levels. 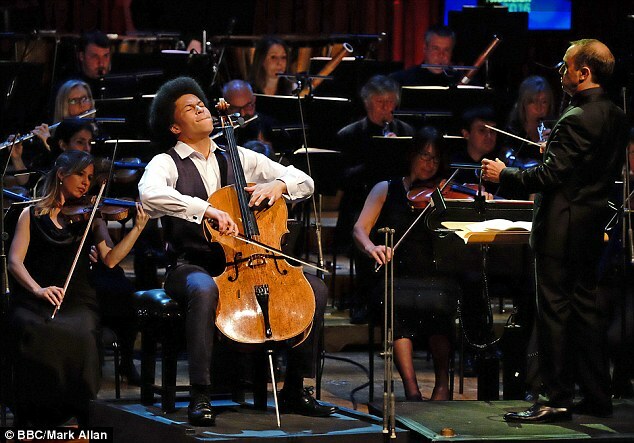 It takes time but does happen and will.’ Sheku is not only the first black winner, but attended a comprehensive school – unusual in highly elite world of classical music. Sheku is looked up to as a role model for black children especially to help them believe all things are possible with God plus hardwork. Being part of a change is good for orchestra ethnic mix reflecting life in London or Nottingham. 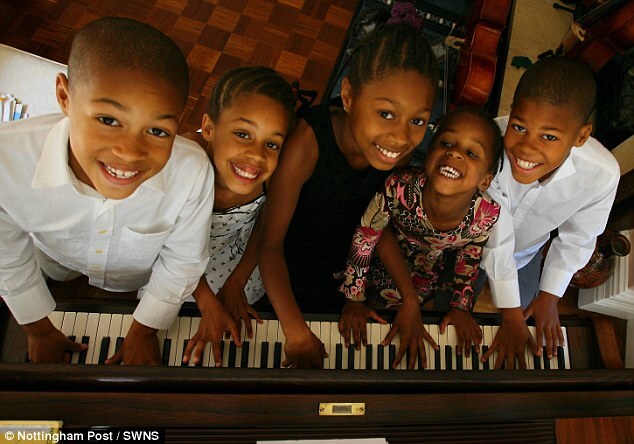 The colour of your skin has no bearing on how well you can play.’ Possibly the most extraordinary family watch them whenever you can, so fascinating. Two younger siblings, Konya and Jeneba, are already planning to enter next Young Musician contest taking place in 2018. It is necessary to remember that behind every great success or achievement is a loving, dedicated, supportive family.The Bible says in Matthew 6:25-34, Therefore I say unto you, Take no thought for your life, what you will eat, or what you will drink or for your body what you will put on. Life is worth more than meat and your body more than clothes. God will supply all your needs according God’s riches in Glory by Christ. GOD PROVIDES NEEDS IN JESUS NAME!! !